Gillian Highland completed her degree in ceramics in 1969 at the West England College of Art in Bristol, where she was taught by Lucie Rie. She spent many of the subsequent years teaching and exhibiting her work. She founded and convened the Canterbury Adult Education Pottery Department, and her work is included in the Kent County Council Art Collection. Gillian re-opened her workshop in 2010 on a full time basis in order to create individual hand made pieces, either for the table or sculptural pieces which could be used outside. Gillian uses clay in an attempt to express her sense of being part of life. Her work design and decoration ls inspired by the landscape in which she lives. 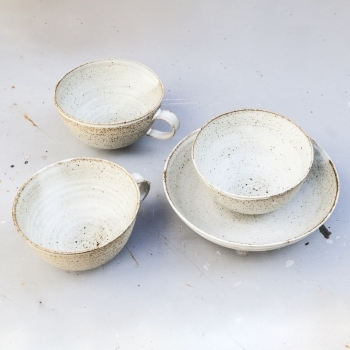 Gillian enjoys the muted subtle colours of reduction stoneware and uses a small palette of glazes to enhance the strength of form.